Introduced in April, 2018, the Audemars Piguet Royal Oak Perpetual Calendar for Latin America ref. 26584OR.OO.1220OR.01 is one of the hottest watches this year. Featuring a gorgeous pink gold toned dial with dark blue subdials, this watch in 18K pink gold is sold with a matching 18K pink gold bracelet accompanied by an additional blue alligator strap with AP folding clasp also in gold. This new Audemars Piguet Royal Oak Quantième Perpétuel —Perpetual Calendar— ref. 26584OR, joins the other three new Royal Oak Perpetual Calendars fitted with a 41 mm case and the new automatic calibre 5134. Available in stainless steel, 18K pink gold and in black ceramic, the Royal Oak Quantième Perpétuel ref. 26574ST in stainless steel, ref. 26574OR in 18K pink gold, ref. 26579CE and now this Latin American Edition ref. 26584OR is what we considered one of the best looking Perpetual Calendars out there and a perfect watch for daily wear. The Royal Oak Quantième Perpétuel returns to the center stage with this Latin American edition. Continuing with the shift in watch case size that began in 2012, this new Royal Oak Perpetual Calendar in 41 mm remains quite thin and wears really more like a 40 mm Royal Oak. The beauty of this new watch not only comes from its pink-toned dial —a shade darker than a salmon colored dial— but also from the highly contrasting blue subdials that are extremely legible. Additionally, the ability to switch from bracelet to strap is highly convenient for those living in Latin America where an AP on strap calls for less attention. The pink gold toned dial along with its dark blue subdials makes for a very eye-catching combination. Thanks to the enlarged size of the case, the watch features a 'Grande Tapisserie' —to learn more about the different types of tapisserie go to this article we published some time ago— dial design that greatly increases the overall aesthetics, balance and legibility of the perpetual calendar indications. One of the great things about this dial, is that is fitted with luminescent material on the applied markers and hands, something really uncommon in a perpetual calendar. The layout of the dial includes all of the traditional indications of a perpetual calendar watch: day, date, highly detailed astronomical moon, month and leap year. In addition, just like on the 120th Anniversary Royal Oak Quantième Perpétuel ref. 25810OR.OO.0944.OR.01 the 52 weeks of the year are indicated by an outer chapter ring with corresponding central hand, adding another layer of time measurement. The white lettering along with the red '31' —slightly pinkish on this picture—, gold surrounds, pink gold hand for the week and the aventurine disc for the moon phase, make this perpetual calendar sporty but very elegant at the same time. The 18K pink gold case measuring 41 mm in diameter is only 9.5 mm in thickness —not far from the 8.1 mm thickness of the Royal Oak Extra-Thin ref. 15202ST.OO.1240ST.01 reviewed here— is extremely solid but also very wearable. The case wears actually slightly smaller than its actual size and more like a 40 mm. You will definitely perceive a difference on how this watch wears when compared to the Royal Oak ref. 15400 that is also fitted with a 41 mm case. The finish as we all know, is the best in the industry with alternating satin brushed finish surfaces and prominent mirror polished chamfers and edges. The total weight of the watch on bracelet is 253.6 grams —as a reference an Audemars Piguet Royal Oak Offshore Rubber Clad in 18K rose gold weighs 225.1 grams. The case features two correctors on each side of the caseband to ease adjustment of the calendar. The watch is also fitted with a screw-down crown. 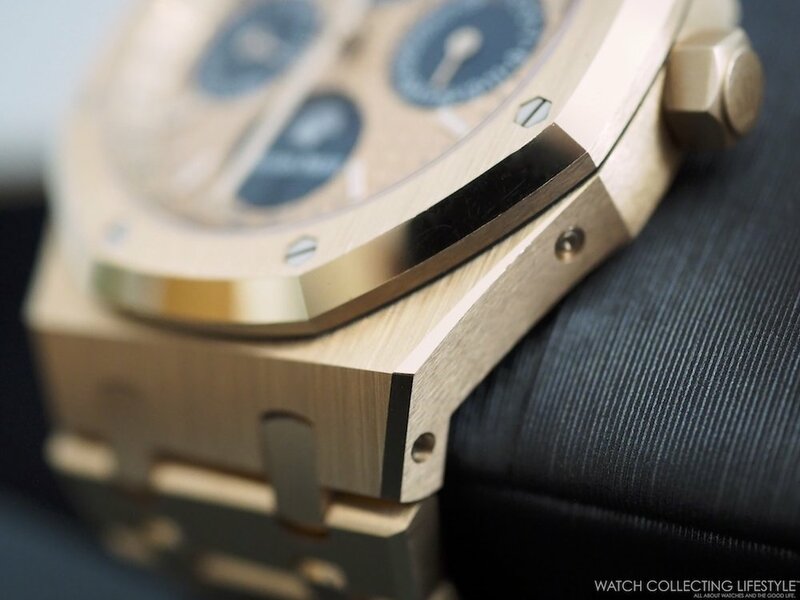 For the very first time, Audemars Piguet decided to sell a watch with both the bracelet and a strap. Therefore, the Audemars Piguet Royal Oak Perpetual Calendar ref. 26584OR Latin America Edition comes with an 18K pink gold bracelet and a dark blue alligator strap with large scales and with gold contrast stitching. The strap comes ready with the 18K pink gold plots that connect to the case and a folding clasp also in 18K pink gold. The bracelet as usual is a work of art on its own and is fitted with a new generation double folding deployant clasp with AP markings on the inside. Without a doubt this is the best bracelet in the watch industry. Like its siblings, the Audemars Piguet Royal Oak Perpetual Calendar for Latin America ref. 26584OR.OO.1220OR.01 is powered by the new in-house automatic calibre 5134 based on its predecessor the calibre 2120. The movement has a total thickness of 4.31 mm and a diameter of 29.00 mm. Composed of 374 parts and 38 jewels, the movement provides a power reserve of 40 hours while oscillating at a frequency of 19,800 vph. The oscillating weight is guided by a peripheral ring rolling on four ruby runners, which reduces friction and wear to the minimum possible. The moonphase indicator, laser microstructured, laid on aventurine that requires correction every 125 years and 317 days. This new model like the unique piece for the 'One Night One Drop Charity Auction' we featured here, not only features this very unique dial configuration but it is also equipped with a very special oscillating weight. The 22K rose gold monobloc rotor is engraved with the façade of the historical Audemars Piguet Manufacture in Le Brassus, Switzerland. The display case back is spectacularly finished with a thick and nice raised engraving surrounding the sapphire crystal that reads "Royal Oak Quantieme Perpetuel". Perhaps the only thing we would’ve also liked is that the 100 pieces in this limited edition were individually numbered but unfortunately they are not and the engraving on the case back only reads “Limited Edition of 100 Pieces”. On the wrist, the watch wears simply out of this world. As mentioned before, the watch wears slightly smaller than its actual size and more like a 40 mm piece on a 7.25-7.5" wrist. The pink gold tone dial with dark blue subdials is extremely legible and highly contrasting. Opposed to most perpetual calendars out there, the best thing about the new Audemars Piguet Royal Oak Perpetual Calendar ref. 26584OR is that because of its design it is a perfect daily wearer with the ability to go from bracelet to strap in a matter of just a few minutes granted you have the right tools. Available in a limited edition of only 100 pieces of which probably no less than 90 are already sold. Grab it while you can! Posted on October 23, 2018 by Editor & Publisher and filed under Audemars Piguet and tagged Audemars Piguet Royal Oak Perpetual Calendar ref. 26574OR Audemars Piguet New Royal Oak Perpetual Calendar Audemars Piguet Calibre 5134 2018 Mainstream Brands Audemars Piguet Royal Oak Perpetual Calendar for Latin America ref. 26584OR.OO.1220OR.01 Audemars Piguet Royal Oak Perpetual Latin America Edition Audemars Piguet ref. 26584OR.OO.1220OR.01 Most Popular.